Quote: If at first you don’t succeed, try, try again. OK I know it sounds a little cliché but, it really applies to me today and for the past week. 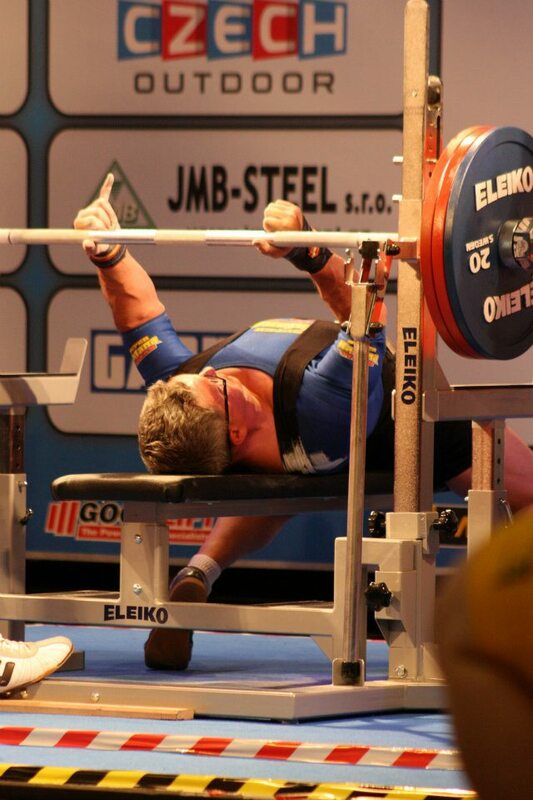 I did not do as well as hope at the World IPF Bench Press meet and I was really disappointed in my performance. With that said I had a great experience and learned a lot. My son is really funny, when I called home to let my children know how I did, he said to me “That’s OK dad you just need to train harder for next time.” Funny and smart that’s my boy. 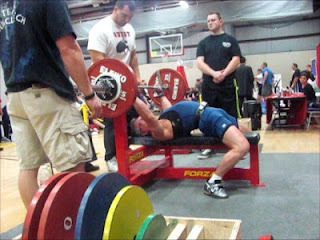 It is now time to get back to training hard and to the National Bench Press meet in Palm Springs California. The coaches we very supportive and gave me a lot of advice. I just need to apply it now. How have you been doing with your diet and exercise plan? If not well then the quote above is good for you as well. We all have moments where we do not succeed right away but as the quote says “Try Try again” One of the things I took away from the meet is that, like in any sport if you miss a pop fly, or the put does not go in, you need to take the next hole or play as a new game all together. We need to forget about the last event we perceive as a failure and move on. The goes for all of in regards to diet and exercise. If we fail in eating something not on plan then you need to move on and continue to make right choices after that. Your exercise schedule needs to be set, however if you miss a day, just be more diligent the next scheduled workout or better yet, get it in later in the day. Tip: Watch your form in all exercises and make sure it is tight. Dedication, WillPower and Implementation are the keys to success. Quote: Dedication, Will Power and Implementation are the keys to success. Tomorrow I leave for the Czech Republic as a nominated member of the USA Bench Press team to compete at the IPF Open World Bench Press Event. I am excited to have this opportunity and look forward to competing and seeing some awesome lifters. Here are 2 links that should have the event if you are interested in watching. As I sit back and access how I got here the quote above came to mind. While I did not start my exercise or diet program to get to where I am today, it did take dedication, will power and implementation to get myself healthy and fit. The byproduct of which is becoming fit and strong enough to compete at the level that I am. If someone had told me back in 2008 as an overweight middle aged man that I would be competing in a world class event I would have doubted them and laughed. What I knew was that at 46 years old and 40 pounds overweight I did not want to have to take medications to be healthy. So, I dedicated me self to an exercise regimen, I mustered up all the will power I had and I implemented a plan to get fit and healthy. As a result of DWPI I am now not only fit and healthy but amazingly an athlete that I thought I would never see again. My point here my friends is that if you Dedicate yourself to a new lifestyle, a lifestyle that includes a dietary change and an exercise program and implement your plan accordingly you will be successful and you never know what new life experiences you will enjoy. OK At the risk of sounding like I read Ann Landers column (does she even still write a column) I found her quote and decided to use it. This really hits home for me and it may for you to. When we make a mistake in life in general that mistake can even rob us of our future if we allow ourselves to dwell on it to long. We do need to learn from our mistakes that is how we grow, however we do not have to beat ourselves up over them. That is counterproductive. You need to apply this to your diet as well. You will make mistakes, eat the wrong food, or even eat it at the wrong time. Learn from that mistake and move on my friends that is how to be successful. I leave for the World Meet this Saturday and I am looking forward to the trip and competing on a world level. I am feeling healthy and strong, although I really miss my workouts this week. It has been a cardio only week for me. My weight seems to be zoned in today except for the water I am carrying this morning. My dinner last night had a little to much salt, this bumped me up to 165.5. This is fine and I am sure it will be back to 163 tomorrow. The birds are chirping and people are already outside running and it is only 6:00 AM. You have to love this. Today I want to address the ladies out there and let them know it is a good thing for them to weight train as well. If I heard it once I have heard it a hundred times. I suggest weight training to a female co-worker or online friend and she says to me I don’t want to get bulked up. Listen in most cases the women you see that are bulky are taking something. I have seen many women in the sport of power-lifting who are very strong and none of them are taking any performance enhancing drugs. They can’t because it would be caught in a drug test. Women simply don't produce enough of the hormone testosterone to build muscle mass the way that men do. If you see an over-muscled woman in a body building competition, chances are that she has used a synthetic testosterone such as anabolic steroids. 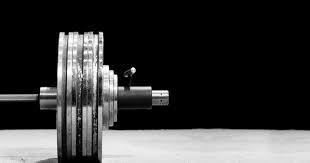 Weight training for a woman will strengthen and tone muscle, burn fat and increase metabolism, not build mass. I have several friends that are female that lift and let me just tell you they are beautiful healthy women who are just that, all woman. I really want you ladies to know not to be afraid of the gym or the weights if you workout at home. So no more excuses ladies, let’s get hitting the dumbbells and if you darling better half has earned the nickname dumbbell please don’t go hitting them. As I write the above it strikes me that it's human nature to focus on what you are good at, but when trying to get fit, you should instead be focusing on what you’re not good at. If your upper body is better developed than your lower body, make sure you assign one or two days per week to work only on this area. My strong point is my bench. My weak point is my legs. I try to hit my legs twice a week. Quoting Ron Harris “If you don’t hate leg day you are working them hard enough”… Let me tell you there are days I hate leg day! The quote above is a proverb I found this morning and truly believe in. It really is the storms in our lives that enable us to take root and learn to take control of our lives. If you are struggling with you diet plan rest assured that you are not the only one and that once you get through this struggle you will be well on your way to a healthier more vibrant you! Good morning everyone, I know it has been sometime since I have posted and I apologize for that. 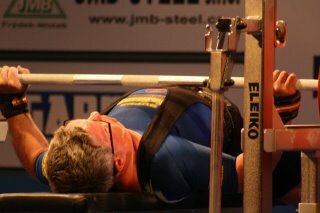 I have been very busy getting ready for the meet in the Czech Republic. Thank you gentlemen. You have all taught me some valuable lessons. I also want to thank the sponsors of the benefit I had on the 29th of April. Now to the week ahead. I woke this morning to a 163.8 body weight which is good. I only have an eighth of a pound to lose by next Wednesday. A full week away to lose that pound and I will not have to dehydrate myself to make weight. Then comes the tricky part of keeping it there. For those looking for an exercise program to follow try one of these. Many times we think that it is impossible to change our eating habits or our desire to exercise or just get our exercise in. However, if we take the time and put forth the effort what was seemingly impossible yesterday can now be probable. You can make the changes in your life that are needed to be successful in your health and fitness goals. There is only one person in your way. YOU! Good morning all and I hope you had a great weekend. I struggled with opening the pool all weekend and of course sporting events with the children. Exercise really is the main ingredient to improving our health or faculties as Hugh Blair have said. I know many people while on the surface look like they could lose a few pounds but are otherwise healthy. This is due to the amount of exercise they get whether from the type of job they do or from the gym. They work hard and keep the heart pumping enough to keep the inner workings of the body healthy. However I will say that in many cases these same people are still in danger and here is why. While they are healthy now eventually their activity levels will drop, especially if their exercise comes from on the job activities. These people have not taught themselves how to eat properly and once they retire or just do not make it to the gym the way they need to, they will put their lives in danger from over eating and due to eating the wrong foods. Diet and exercise need to go hand and hand. I saw something this weekend that really has me thinking today. 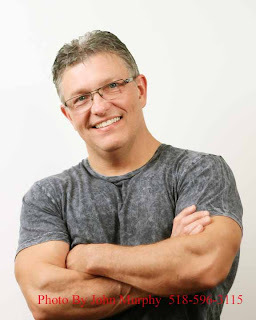 I have often mentioned that your cardio needs to be intense enough that your breath is labored, this making it difficult to talk during your cardio. Anyway while working outside I saw a neighbor, I do not know her, walking. She was dressed in typical female workout attire and was out for a walk. The one accessory I noticed that has me perplexed was she was carrying cell phone. OK I can understand carrying the phone in case something happened, an emergency at home or even during your run or brisk walk. However this was not the case with this woman. She was having a leisurely conversation with someone on the other end. Now here is my dilemma, I have said many times just get up get out there and get going. Some exercise is better than no exercise. This woman was a least out there trying to make a difference in her life. Then the other part of my mind kicks in and says “THAT IS NOT CARDIO, she is robbing herself of an opportunity to really get the most out of the activity.” I guess I have to be both happy for her and disappointed in her. If you follow this blog I hope you really try to get the most out of your exercise sessions. I will be working legs today. All machines for me today, leg press, leg curls, leg extensions. I will also through in some lunges. I need to get bigger glutes to be able to get a better arch in the bench. Tip: Always try to improve on your last workout session. This is how we get stronger and healthier. A funny but, true quote for today, I hope you apply it the way I will. Applying it to your diet takes a more than just showing up though. I would say you need to at least apply the 80% to planning the appropriate meal and the 20% would be just eating it. Exercise is where I really see the benefit for this quote is. Once you get to the gym or the area of your home where you exercise regularly your body becomes prepared for the stress and performance to follow. My workout partner and I often start yawning like crazy as we enter the gym. Our brains are telling the rest of our body to get ready because the real work is about to start. The yawning is not boredom setting in but instead it is our bodies taking in as much oxygen as possible to get prepared. I choose to ignore definition d: a regimen of eating and drinking sparingly so as to reduce one's weight this is because if we look at the other definitions we can see that our diet is more of a life style of eating, the means by which we seek nourishment to sustain ourselves or to improve our health. Really if we had maintained a proper diet throughout our lives we would never find ourselves over weight in the first place. However that is not the case for most of us and at some point in time we made the choice to choose food or food substances that had a negative effect on us. I say food substances because I have never seen a Frito, Dorito, Cheese Puff and any other of the sundry of items that many people consider food growing on a tree or from the ground. I am also pretty sure I have never seen a Frito foraging for food in the woods. It seems to me that many of the issues we have health wise can in many cases be traced back to processed foods. When did we become so lazy to not take the time to cook a healthy meal for ourselves? Besides cooking together can be a healthy and enjoyable process for couples. I think I have rambled enough about processed foods. My training has been going very well. I have been training very hard in the bench shirt every week. Normally a person would only train in the shirt every other week. I however do not have that luxury. I have had to train every week in the shirt for the past 6 weeks and have made some great progress doing so. 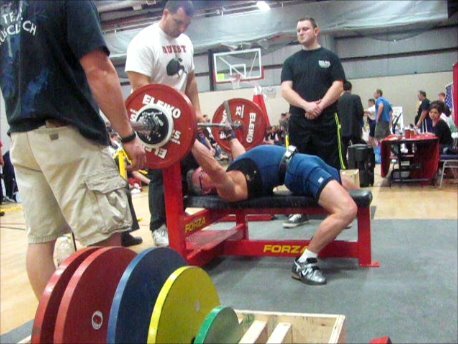 I do think I will hit a 500 bench in the shirt someday and will continue to work hard towards that goal. Since training so much in the shirt my shoulder have ached to the point that I have not been squatting in a couple of weeks, I will start squatting again this Sunday with an Easy bar. 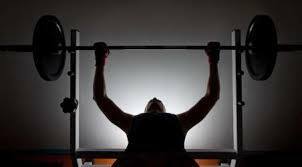 With this type of bar I will be able to keep my lower body strength up and even improve without putting all the pressure on my shoulders while stretching my arms out to the bar. My arms will be in front of me and this will protect my joints. 1 Use an approximate shoulder-width foot stance. 2 Descend in a controlled manner. 3 Ascend at a variety of speeds (including fast but controlled). 4 Exhale after the major effort on the ascent. 5 Avoid bouncing or twisting in the bottom position. 6 Maintain a normal posture with an erect spine. 7 Descend to the point where the tops of the thighs are parallel to the floor. 8 Keep feet flat on the floor.